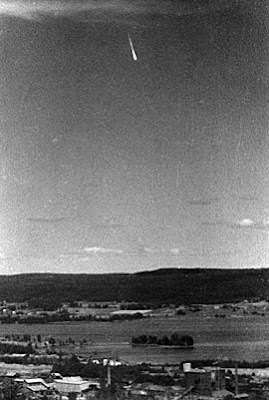 Sometime early in 1946, strange objects began to appear in the skies above Sweden. It wasn't the first time this sort of thing had happened. During WWII neutral Sweden had been at the forefront of Allied research into Hitler's V weapons due to it's proximity to the research site at Peenemünde, and it's "luck" to be the crash site of several wrongly directed V2 rockets (timeline here). But in early 1946, the war had been over for more than six months. The Nazi's had long before abandoned their V2 research sites and they were now under new management (our old friends the Soviets). So where were these new aerial phenomena coming from? The first reports of luminous fireballs and mysterious lights in the sky started to come in during February 1946. As the months went by the sightings became both more frequent and more descriptive. Over the course of about a year over 2000 objects would be reported in Denmark, Sweden, Norway and Finland. Most, like the picture below, would turn out to be mis-identifications of meteors and the like, but some remain unexplained. Picture of a probable meteor taken by Erik Reuterswärd. Object w/ blue & green flashing lights crashed into lake. Projectile trailing luminous smoke slammed into beach. Slaglike material. Cylinder 20-30m in dia. Military investigated. Cigar shaped object, 5 ft. long trailing smoke landed on small uninhabited island. Ghost rocket exploded breaking windows & dropping fragments. Small dart with wings & ball shaped tip exploded as it crashed into water. 2 - 8' long missiles with wings crashed into lake with notable turbulence. These reports were taken very seriously by the Swedish military, especially given the emerging political order of the soon to start Cold War, and an investigation launched under the leadership of Swedish Air Force officer Karl-Gösta Bartoll. 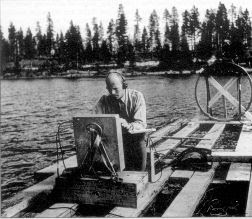 Karl-Gösta Bartoll at Lake Kölmjärv on July 19, 1946 investigating "crash"
Searches were conducted for the remains of objects at crash sites and whilst some things were found, all were later put down to meteor debris. Gradually the sightings dropped off in Scandinavia and the investigation found nothing concrete although Bartoll always insisted what people were seeing was something "real". Further sightings were reported in other parts of Europe, mainly Greece but also in Belgium, Portugal and Italy. So what were they? It's hardly likely that the Soviets had, within a year of the end of the Second World War, reestablished the V2 experiments and moved them on to the point of having the V2 rockets be maneuverable. It is also highly unlikely, given the situation at the time, that they'd risk an international incident by testing these over the northern European skies. I find it unlikely any other player on the international scene would get involved. Whilst the idea that these were alien spacecraft of some form is widespread, again I just don't see it. 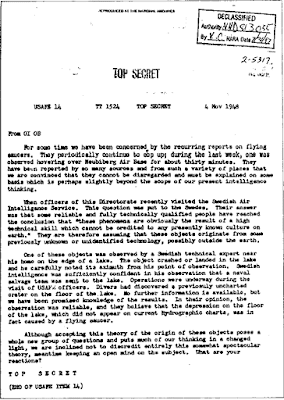 Why would they do something so distinctive from other UFO reports for just that year in just that place? Makes no sense. Personally, based on the lack of physical evidence or witness testimony to the contrary, I believe these to be meteors and other natural phenomena reported by people already paranoid because of the world events unfolding before them, and no doubt some were embellished a little. The evidence for anything else is just so weak and scarce I can't see any other sensible explanation. Sadly I think the ghost rockets were not as exciting as the name would suggest.